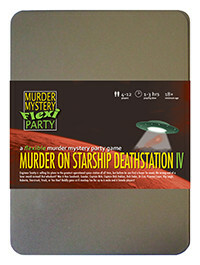 You've been invited to play the role of Captain Birk in Murder on Starship Deathstation IV. The infamous Engineer Snotty has just finished the plans for the greatest operational space station of all time, and now he’s invited all sorts of scum and villainy from the across the galaxy to bid for them. But before the auction can begin, Snotty is found in pieces, literally, on the wrong end of a laser-sword! Can you boldly go and find his killer before they strike back again?! CAPTAIN BIRK is a highly decorated Starship captain and likes to relive his glory days by wearing his Captain’s uniform, black trousers and mustard yellow jersey. Military boots complete the picture. As a promising starship crewman Birk quickly made his way through the ranks to Captain. He still relives and recounts his glory days, as several younger replacements have now taken over his role, but has hit the alcohol since being decommissioned. This caused his marriage to hit the rocks too, and Birk spent a long time in holo-deck rehab trying to piece himself back together. Now he mainly teaches at Starship Academy, and has a strange affection for holo-decks. He’s also good friends with Dr Bones and the vulcan Sock, and will generally gravitate towards them in social situations if they’re around. I’m Captain Jim Birk. I used to pilot the Starship Death Station many years ago, but now I’m working as a diplomat for the Cling-Ons. It’s a strange and long story, and one I’m sure I’ll bore you with as the evening progresses. Alas poor, Snotty, I knew him well. Very well actually, we worked here together back in my day. It’s a shame I was pleasuring myself on the holo-deck at the time of his demise or I may have been able to save him.